Recent Arrival! **One Owner**, Low Mileage, Leather, AWD, 18" Alloy Wheels, 3rd row seats: split-bench, 4.25 Axle Ratio, 4-Wheel Disc Brakes, 7 Speakers, ABS brakes, Air Conditioning, AM/FM radio: SiriusXM, Auto-dimming Rear-View mirror, Automatic temperature control, Brake assist, Bumpers: body-color, Compass, Delay-off headlights, Driver door bin, Driver vanity mirror, Dual front impact airbags, Dual front side impact airbags, Electronic Stability Control, Exterior Parking Camera Rear, Four wheel independent suspension, Front anti-roll bar, Front Bucket Seats, Front Center Armrest, Front dual zone A/C, Front fog lights, Front reading lights, Fully automatic headlights, Garage door transmitter: HomeLink, Heated door mirrors, Heated Front Bucket Seats, Heated front seats, Illuminated entry, Leather Shift Knob, Leather-Trimmed Seats, Low tire pressure warning, Occupant sensing airbag, Outside temperature display, Overhead airbag, Overhead console, Panic alarm, Passenger door bin, Passenger vanity mirror, Power door mirrors, Power driver seat, Power Liftgate, Power moonroof, Power passenger seat, Power steering, Power windows, Radio data system, Radio: AM/FM Audio System, Rear air conditioning, Rear anti-roll bar, Rear reading lights, Rear seat center armrest, Rear window defroster, Rear window wiper, Remote keyless entry, Security system, SiriusXM Radio, Speed control, Speed-sensing steering, Speed-Sensitive Wipers, Split folding rear seat, Spoiler, Steering wheel mounted audio controls, Tachometer, Telescoping steering wheel, Tilt steering wheel, Traction control, Trip computer, Variably intermittent wipers. Modern Steel 3.5L V6 24V SOHC i-VTEC 6-Speed Automatic AWD 4D Sport Utility 26/18 Highway/City MPG** Pilot Honda Reviews: * A versatile, roomy interior with spacious rear seats; ride is smooth and compliant in most conditions; better fuel economy than rivals; multiple clever storage compartments. Source: Edmunds 18/26mpg** 2017 Give us a call today to schedule a test drive at (913) 945-1687!! O'Neill Honda is Kansas City's leader in pre-owned vehicles, customer satisfaction, & friendly service! Awards: * ALG Residual Value Awards * 2017 IIHS Top Safety Pick+ (When equipped with Honda Sensing and specific headlights) * 2017 KBB.com Best Buy Awards * 2017 KBB.com 12 Best Family Cars * 2017 KBB.com Brand Image Awards * 2017 KBB.com 10 Most Awarded Brands 2016 Kelley Blue Book Brand Image Awards are based on the Brand Watch(tm) study from Kelley Blue Book Market Intelligence. Award calculated among non-luxury shoppers. For more information, visit www.kbb.com. Kelley Blue Book is a registered trademark of Kelley Blue Book Co., Inc.
Certified. **RECENT TRADE**, This great find will NOT last! Call today!, 4-Wheel Disc Brakes, 7 Speakers, A/V remote, ABS brakes, Air Conditioning, AM/FM radio: SiriusXM, Anti-whiplash front head restraints, Automatic temperature control, CD player, Dual front impact airbags, Dual front side impact airbags, DVD-Audio, Emergency communication system: HondaLink, Entertainment system, Four wheel independent suspension, Front anti-roll bar, Front dual zone A/C, Headphones, Knee airbag, Low tire pressure warning, Memory seat, Navigation System, Occupant sensing airbag, Overhead airbag, Power driver seat, Power moonroof, Power steering, Power windows, Radio data system, Radio: 160-Watt AM/FM/HD/SiriusXM Audio System, Rear air conditioning, Rear anti-roll bar, Rear audio controls, Rear window defroster, Remote keyless entry, Speed-sensing steering, Steering wheel mounted audio controls, Traction control. Silver 3.5L V6 SOHC i-VTEC 24V 10-Speed Automatic FWD 4D Passenger Van 19/28 City/Highway MPG Odyssey Honda 19/28 City/Highway MPG 2018 Odometer is 9960 miles below market average! Honda Certified Used Cars Details: * 182 Point Inspection * Limited Warranty: 12 Month/12,000 Mile (whichever comes first) after new car warranty expires or from certified purchase date * Powertrain Limited Warranty: 84 Month/100,000 Mile (whichever comes first) from original in-service date * Transferable Warranty * Roadside Assistance * Warranty Deductible: $0 * Vehicle History Give us a call today to schedule a test drive at (913) 945-1687!! 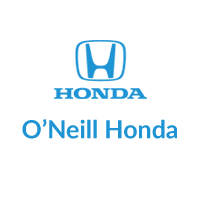 O'Neill Honda is Kansas City's leader in pre-owned vehicles, customer satisfaction, & friendly service!